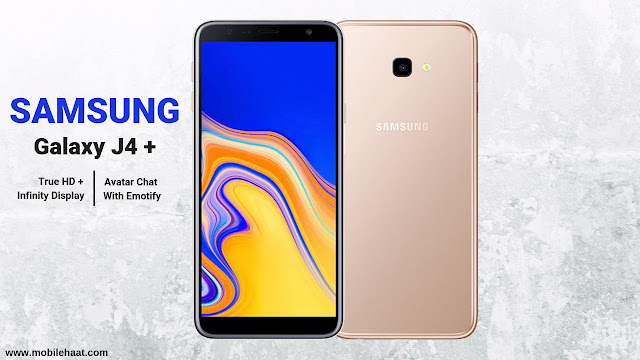 The Samsung Galaxy J4 Plus is a mid-range smartphone that tries to provide quite a bit of functionality. The rear camera shoots great videos and pictures, but it doesn't leave a deep impression on it, and its picture quality is very mediocre. The battery and memory are very suitable and can be called the key functions of the device. The device's configuration is average, it does not support high-end games, but it can provide excellent performance for medium users. Overall, it's a budget-oriented device with all the features users want in their smartphones. The Samsung Galaxy J4 Plus features a 6-inch ultra-high display with a screen resolution of 720 x 1480 pixels. The display type is Super AMOLED, which provides a pixel density of 274ppi. This provides users with an advanced display for the best gaming and multimedia experience. The device is equipped with a 13MP rear camera and has many features that allow you to click on great photos even under adverse conditions. The device's front camera has a resolution of 5 megapixels and is equipped with an LED flash for a self-portrait. The device is powered by a 3,300mAh Li-Ion battery, ensuring a one-day backup. The Samsung Galaxy J4 Plus runs two SIM cards and supports 4G networks and VoLTE services. The device also offers a number of other connectivity features such as Wi-Fi 802.11 b / g / n, Bluetooth v4.2, A-GPS with GLONASS and more. The device offers 32GB of internal storage and 512GB of expandable storage. The Samsung Galaxy J4 Plus features a 1.4GHz quad-core processor (Cortex A53) and 2GB of RAM. This powerful combination is on the Qualcomm Snapdragon 425 MSM8917 chipset and Adreno 308 graphics card. Operating System: Android Oreo v8.1. Graphics Processing Unite (GPU): Adreno 308. Body: 161.4 x 76.9 x 7.9 millimeter. Weight: 178 grams (plastic body). Sensors: Fingerprint, accelerometer, proximity, compass. Display Resolution: HD+ 720 x 1480 pixels. Display Protection: 18.5:9 ratio Full-View TFT Infinity Touchscreen. Colors Available: Black, Gold, Pink, Blue. Camera Factors (Back): Autofocus, auto face detection, f/1.9 aperture, 28mm wide-angle lens, LED flash, HDR, panorama mode. Camera Resolution (Front): 5 Megapixel f/2.2 aperture, LED flash. Memory Card Slot: MicroSD, up to a massive 512 GB dedicated slot. Battery Type & Performance: Li-ion 3300 mAh, non-removable. MP3, MP4, FM Radio & Recording. USB: MicroUSB v2.0, USB-on-the-go (OTG).